On November 9 – 11, 2017 the 50th Congress of the Federation of the European Bars on “The role of lawyers in protecting the planet” took place. On this occasion President Maria Ślązak sent a letter to the FBE thanking for the invitation for this event and underlying significance of the problem of protecting the Earth by all, also by lawyers. AEA-EAL immediate past President Monique Stengel participated this conference. Please find below her information about the event. 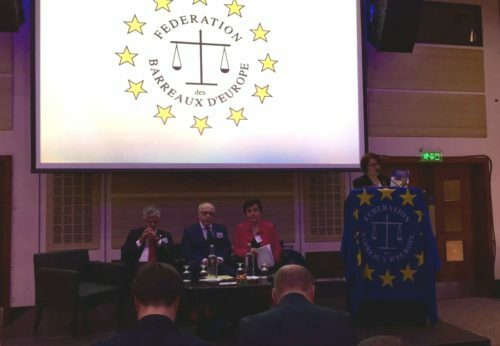 Monique Stengel as immediate past President representing the AEA-EAL participated to the 25th Anniversary of the Fédération des Barreaux d’Europe- European Federation of Bars which took place in London under the dynamic and engaged organization of the President, Mrs. Prof. Sara Chandler. As it was the 25th Anniversary of FBE-EFB, different international and European Lawyers associations were represented. As for the CCBE, UIA and IBA, it has been for the AEA-EAL a pleasure and great honour to open this congress by congratulating FBE-EFB for this important occasion. For this meeting, the FBE choosed as topic for this Congress the topic .. “Lawyers and climate changes”. If some may have thought wrongly that it is a very specific topic, the quality and engagement of all speakers from different European States showed that it is a crucial topic for the future and survival of our world and, yes, Lawyers may be active in very different ways . It was again a nice opportunity to meet colleagues, representatives of Bars from different European countries to exchange ideas ans discuss possible common actions of our profession in Europe but also outside Europe, specially for the protection of Human Rights and Liberty. Once again, the AEA-EAL was very happy to participate to a meeting of the FBA-EFB as we all share the same enthusiasm for Europe and the place of the Lawyers in Europe!